This section contains products to help correct posture and relieve back strain due to poor posture. Garments from top manufacturers including DMI and FLA Orthopedics. 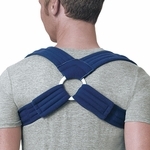 Posture braces are excellent for people with osteoporosis and other posture conditions. They help to restore posture and reduces back strain. Easy to wear under clothing.